This Government Agency Has the Power to Stop the Dakota Access Pipeline. Will It? It is time for the Army Corps of Engineers to make amends for its past treatment of the Standing Rock Sioux and other tribes by stopping the pipeline. Lyle Uses Arrow of the Standing Rock Sioux Tribe stands atop a high hill and surveys his homeland. To the south lie the flooded ruins of his grandparents’ ranch. To the east, the sluggish Missouri River flows between wide banks. And to the north, just beyond the next ridge, sits Oceti Sakowin, the sprawling camp of the Seven Council Fires, where indigenous nations from across the continent have come together to assert tribal sovereignty, protect their sacred waters, and defeat the oil pipeline being built beside the tribe’s reservation. 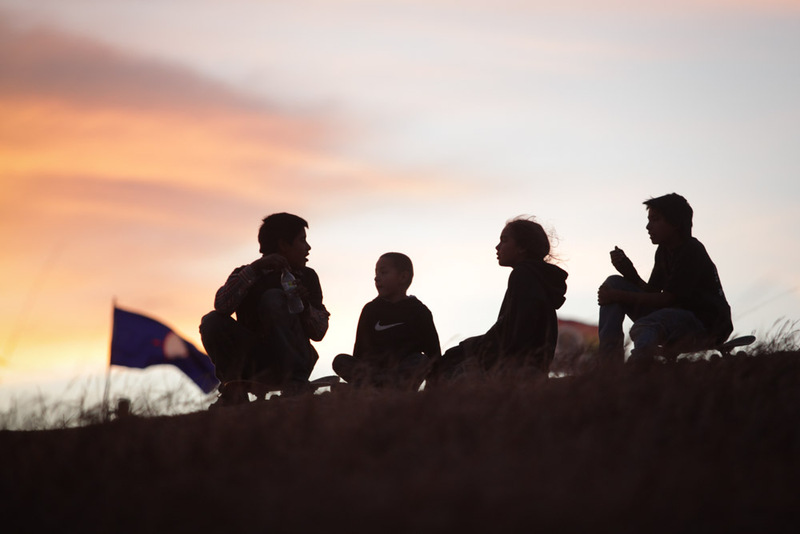 The gathering at Oceti Sakowin is the most significant mobilization of North American native nations in a generation or more, and, indeed, walking among the tents and teepees, the open fires and windblown flags, the laughs, songs, and prayers, one feels steeped in historic consequence. The people here, after all, aren’t just resisting the Dakota Access pipeline (DAPL), heavily armed police, and North Dakota’s far-right political establishment. They face another, older foe as well—the US military and its Army Corps of Engineers. If you’ve heard of the Army Corps, it’s probably in relation to the abysmal 2005 failure of its hurricane-damaged levees in New Orleans. But in Indian Country, where memories don’t fade fast, the Corps has a longer and more disturbing legacy. From Washington State and New Mexico to the Dakotas and New York, the United States’ premier public engineering and construction agency is known for erecting dams that severely damaged tribal lands, destroyed livelihoods, and trampled treaty rights. On this reservation and others like it, the Corps has a history of sacrificing native well-being for the benefit of white settlers. 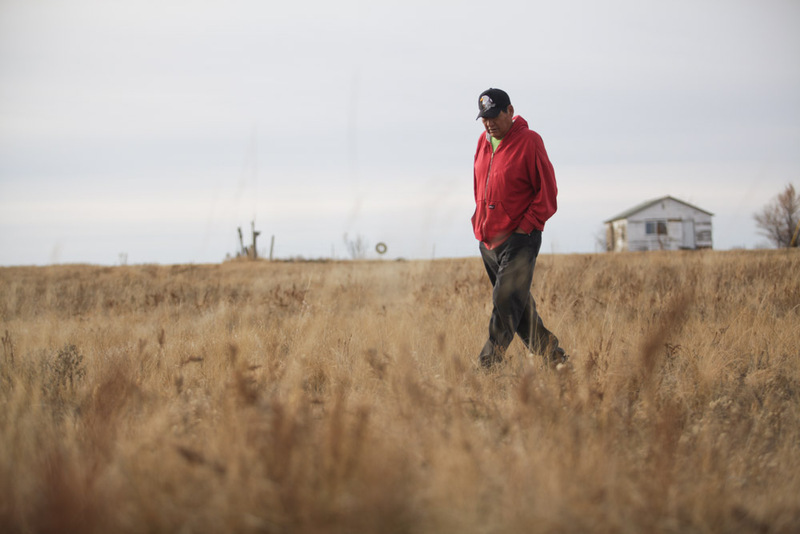 “To put it bluntly, I’d say [the Army Corps] doesn’t give a heck about natives,” says Uses Arrow, a 60-year-old elder, as he looks out on the big river. “It never has,” he adds. Nevertheless, the Corps is the sole government authority still standing in the way of the Dakota Access pipeline’s march across the plains. The $3.8 billion “black snake,” as the Sioux call it, will carry oil from North Dakota’s fracking fields all the way to Illinois. In order to place pipe beneath the bed of the Missouri River and thereby complete the project, however, the principal developer, Energy Transfer Partners, must obtain an easement from the Corps. Despite the company’s feverish construction activity near the Missouri River in recent days, that easement has not been issued. Mass demonstrations at Army Corps offices across the country this Tuesday are asking the agency to deny it outright. For the Sioux and other tribes along the Missouri, Dakota Access is a disaster. Though Energy Transfer Partners originally considered building the pipeline north of Bismarck, it was moved south of the capital city because, in part, of water-quality concerns. The EPA and the Department of the Interior have since objected to the project’s potential impacts on indigenous nations. DAPL reeks of environmental racism. More than anything, though, this fight is about tribal sovereignty: The pipeline threatens lands, water, sacred sites, and natural resources, the rights to which were never relinquished by the Sioux. To Lyle Uses Arrow and others like him, DAPL is a flagrant assault on Sioux national security and an affront to native dignity. The Standing Rock resistance presents the Army Corps with a crucial opportunity to begin making amends for its terrible legacy among many native nations. On November 10, a spokesperson for the Corps announced that the agency will reveal “next steps or a path forward” on the pipeline within days. The native peoples here are praying that the Corps will overturn the ugly precedents of history and help defeat the fossil-fuel interests amassed along sovereign Sioux borders. When the waters rose, Lyle Uses Arrow’s family was forced to relocate. His grandparents hadn’t wanted to give up the wooded, wildlife-rich bottomlands along the Missouri River where their relatives had long lived. But the Army Corps offered them no choice. The Corps completed construction of the Oahe Dam on the Missouri River in the early 1960s and created a massive reservoir that drowned more than 55,000 acres on the Standing Rock reservation. One hundred and ninety Sioux families—or roughly one-third of the reservation’s population at the time—were evicted from their homes. According to historian Michael Lawson, whose book Dammed Indians discusses the Oahe Dam in detail, the tribe’s best ranch land, most of its gardens and farm tracts, and almost all of its timber, wildlife, and wild-fruit resources were destroyed. Economic calamity ensued. Uses Arrow, who was a child when the dam was finished, recalls what his forebears told him about those bottomlands: “They said it was beautiful. They said birds were singing there all the time and there was a forest of cottonwood. There was wildlife.” Wearing a red sweatshirt and a black “Native Pride” cap, he walks out on a ridge above the Missouri and points toward the place where the family’s ranch used to stand. “It was our playground,” he says. The Oahe Dam was just one component of a multibillion-dollar construction frenzy that the Army Corps and its dam-building rival, the Bureau of Reclamation, completed in the region during the 20th century. Called the Pick-Sloan Plan and initially authorized by Congress in 1944, the project erected five massive dams on the Missouri and numerous smaller dams on its tributaries. It sought to provide hydroelectric power, irrigation infrastructure, and flood-control services across the Great Plains and the Midwest. White farmers and town folk benefited immensely from the government largess. Native Americans, meanwhile, saw their treaties abrogated and lands devastated. Tribes sought to stop or stall the Pick-Sloan Plan, of course. There were lawsuits and protests. There were appeals to Congress, heated negotiations, and hurried financial settlements. Overall, however, the federal government paid little heed to the sovereign treaty rights of tribal nations. Only much later, after the damage was done, did Congress attempt to adequately compensate the Standing Rock Sioux and other tribes for the loss of their priceless riparian parcels. In 1992, Lawson says, it established trust funds, ranging from $90 million to nearly $300 million, for the various tribes that were Pick-Sloan’s victims. Today’s anti-pipeline resistance is best understood in the context of the Army Corps’ past actions. The Oceti Sakowin camp, where as many as 8,000 “water protectors” are currently gathered, is located on 1851 treaty land that the Army Corps requisitioned for the Oahe reservoir. And many of the tribal nations that stand in solidarity with the Standing Rock are also Army Corps survivors. The Colville confederacy of Washington State had some of its best Columbia River bottomlands and salmon runs destroyed by the Corps’ Chief Joseph Dam in 1958. Now Colville is sending truckloads of firewood to support the Sioux, and some of its members have even come cross-country to take part in the peaceful resistance. Most crucially, the Standing Rock elders and leaders active today are immediate descendants of those who witnessed the Army Corps’ Oahe Dam devastation. They now watch with horror as the very same agency considers allowing a pipeline to burrow below the beloved river. “We are the children of Oahe,” says Phyllis Young, a former tribal councilwoman and elder who is one of the pipeline’s fiercest opponents. Her family, too, was flooded out of its riverside home when she was a young child, and she sees clear connections between the Army Corps’ history here, the development of Dakota Access, and the militarized police that are defending it. “We want to demilitarize the river,” she declares from behind a long wooden table at tribal headquarters. That means, first and foremost, stopping its further desecration by an oil pipeline. Needless to say, mistrust of the Army Corps runs deep, and not just because of Oahe. Last week the tribe obtained evidence that the agency, in at least one instance, asked the Morton County Sheriff’s department to take action against the water protectors. In a November 1 letter, the Corps’ local commander, Colonel John Henderson, asked Sheriff Kyle Kirchmeier to remove “trespassers” from Army Corps land near the pipeline construction site. “On behalf of the Corps of Engineers, as a property owner,” he wrote, “I am requesting law enforcement assistance in this matter, as needed.” The police responded with force, using mace and rubber bullets to suppress the unarmed crowd that had gathered on the contested terrain to conduct a prayer ceremony. Pictures of the crackdown, like other possible civil-rights violations that have taken place here, ricocheted across the Internet. Despite the Corps’ troubling past, the tribe still hopes that President Obama, who made an official visit to the Standing Rock reservation in 2014, will order the agency to block the pipeline. They want the Corps and its top commander to take a stand against DAPL before Trump takes power. The president-elect, after all, is directly invested in Energy Transfer Partners, and the company’s CEO, Kelcy Warren, donated generously to his hate-filled campaign. The Army Corps did not answer questions about the history of the Oahe Dam for this story. However, in addition to revealing last week that it will make a major announcement regarding the Dakota Access pipeline in the coming days, it also requested that Energy Transfer Partners temporarily cease pipeline construction. Instead, on Election Day, the pipeline company declared that it would begin preparations to drill under the Missouri River. It expects to obtain all necessary permits and to have the project fully operational come spring. If Lyle Uses Arrow and his contemporaries are children of Oahe, then his grandson Kenyon is a child of Oceti Sakowin. He’s one of the many young men and women who can be seen riding horseback around the main camp at the reservation’s edge. And he’s one of the young water protectors who traveled to New York last month to take direct action inside Hillary Clinton’s campaign headquarters. “I’m proud of him, boy,” says Uses Arrow. “He wants people to know what’s happening here.” Uses Arrow is also proud of the Standing Rock Sioux leadership, which has exhibited relentless determination in its resistance to the Army Corps, the pipeline and the police. Late on the afternoon of November 14, the U.S. Army Corps of Engineers delivered a damaging, though non-lethal, blow to the beleaguered Dakota Access pipeline. 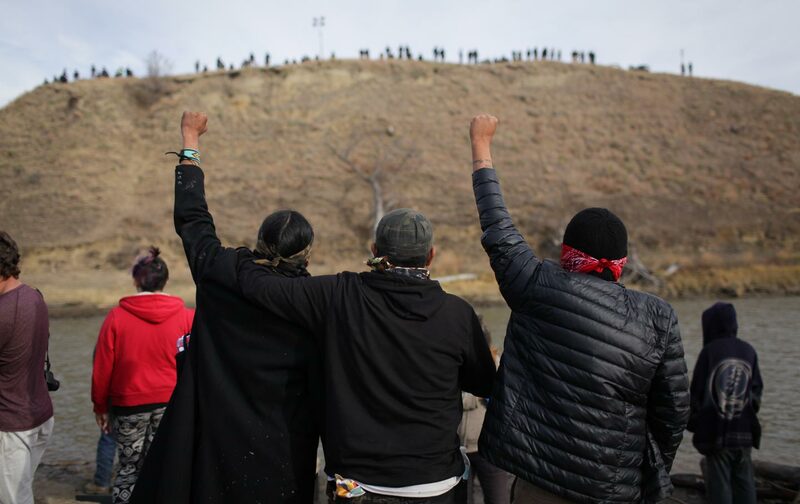 The agency announced that it would block continued pipeline construction on federal land near the Missouri River while it seeks additional input from the Standing Rock Sioux Tribe. The decision amounts to a victory for the tribe, which has waged a months-long resistance campaign to prevent the fossil fuel project’s completion. But it is an incomplete victory: the Sioux seek to stop the pipeline outright; the Corp’s decision only delays it, and for how long nobody knows.